In Urban Sprawl and Public Health, Howard Frumkin, Lawrence Frank, and Richard Jackson, three of the nation's leading public health and urban planning experts explore an intriguing question: How does the physical environment in which we live affect our health? For decades, growth and development in our communities has been of the low-density, automobile-dependent type known as sprawl. The authors examine the direct and indirect impacts of sprawl on human health and well-being, and discuss the prospects for improving public health through alternative approaches to design, land use, and transportation. Urban Sprawl and Public Health offers a comprehensive look at the interface of urban planning, architecture, transportation, community design, and public health. It summarizes the evidence linking adverse health outcomes with sprawling development, and outlines the complex challenges of developing policy that promotes and protects public health. Anyone concerned with issues of public health, urban planning, transportation, architecture, or the environment will want to read Urban Sprawl and Public Health. "Suburban sprawl is killing us. Increasingly, physicians, public health officials, planners, and designers recognize the relationships between our health and our built surroundings. Urban Sprawl and Public Health offers a cogent diagnosis of this health menace as well as timely prescriptions for healing our cities." "A growing body of research demonstrates that community design and our built environment have enormous potential for addressing many of our chief public health concerns. The authors convincingly argue that building a healthier future is not only possible, but essential." "No one chooses to be obese, in poor health, or stuck in traffic. Frumkin, Jackson, and Frank make the compelling point that unless Americans are given more choice in where and how they live and travel, all of us will bear the burden, not just in terms of extra pounds, but also in terms of lower quality of life, higher health care costs, reduced life expectancy, and greater isolation, especially at the vulnerable beginning and end of our lives. I hope every elected and appointed official in the U.S. reads this book and then acts on it to avert the economic and health crisis that is fast headed our way." 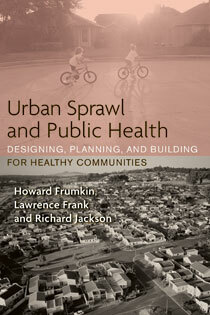 "Years ago, we could see that the correlation between sprawl and poor health should be made. Now it is done. Urban Sprawl and Public Health details how our lifestyle leads to serious health problems. This book should be reviewed widely and its facts should be known by all of us. It will be one of the central texts of the New Urbanism." Andres Duany, author of "Suburban Nation: The Rise of Sprawl and the Decline of the American Dream"
"Urban Sprawl and Public Health is written for urban planners, public health practitioners, and the general public....Overall, the authors provide a well-informed discussion on urban planning and health issues and present feasible public health solutions that may be incorporated into many urban development projects." "Frumkin, Frank and Jackson acknowledge that sprawl does not fully explain our American lifestyle, but they present some pretty convincing evidence for changing the way we live." Chapter 1. What Is Sprawl? What Does It Have to Do with Health?